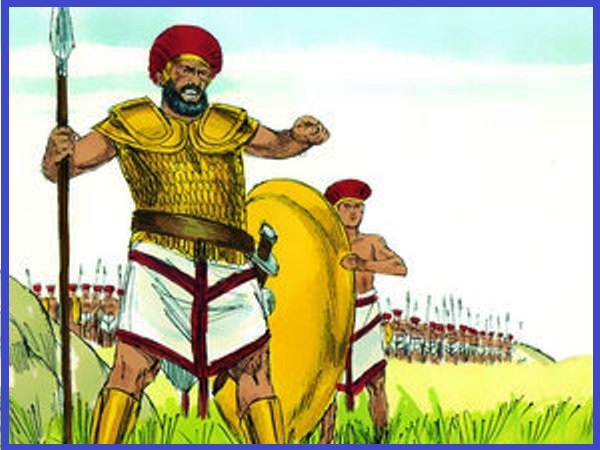 Did you know that the Philistines who lived close to the Israelites were their enemies? Yes, they were and here they go again gathering their armies for war. They met at Socoh, which was an area in the state of Judah. Their camp was located at Ephes Dammim between Socoh and Azekah. They sure had interesting names for those areas don’t you think? King Saul and the Israelites gathered in the Valley of Elah. And they camped there. 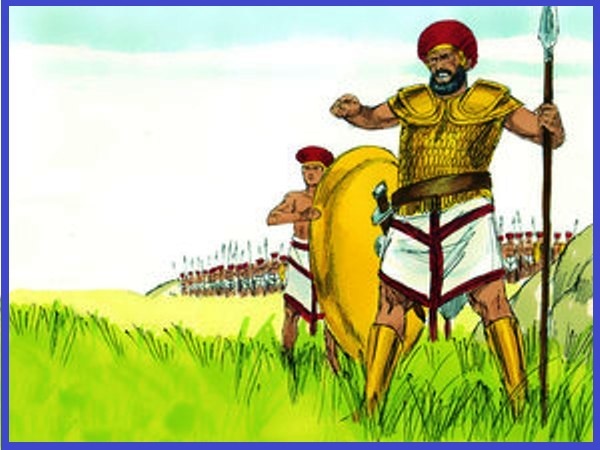 They got ready and took their positions to fight the Philistines. 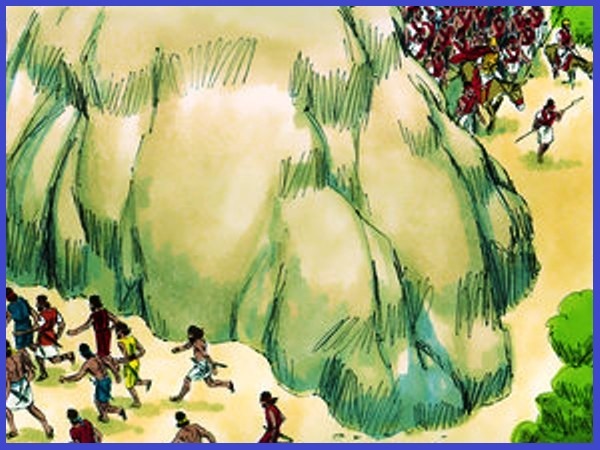 The Philistines controlled one hill and the Israelites controlled another. The valley was between them. Now, the Philistines had a champion fighter named Goliath. He was from a city called Gath and he was about nine feet four inches tall. 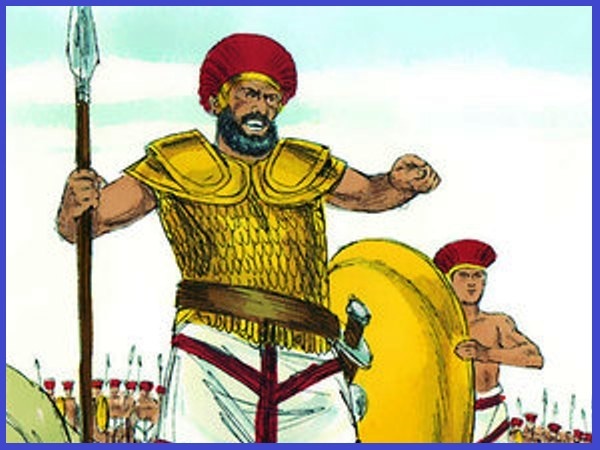 At this time, he came out of the Philistine camp with a bronze helmet on his head. He also wore a coat of scale armor. It was made of bronze and weighed about 125 pounds. Can you imagine carrying an armor that weighed 125 pounds? That was not all, he wore bronze protectors on his legs, and he had a small spear of bronze tied on his back. The wooden part of his larger spear was like a weaver’s rod, and its blade weighed about 15 pounds. He also had an officer who carried his shield and he walked in front of him. Now when Saul and the Israelites heard the Goliath’s words, they were very afraid. Now while this was all going on, David who was the son of Jesse and lived in Bethlehem in Judah had 7 brothers and three of the oldest sons followed Saul to the war. The oldest son was Eliab then came Abinadab and then Shammah were soldiers in Saul’s army. David was the youngest and he was a shepherd and he also knew how to play the harp really well. 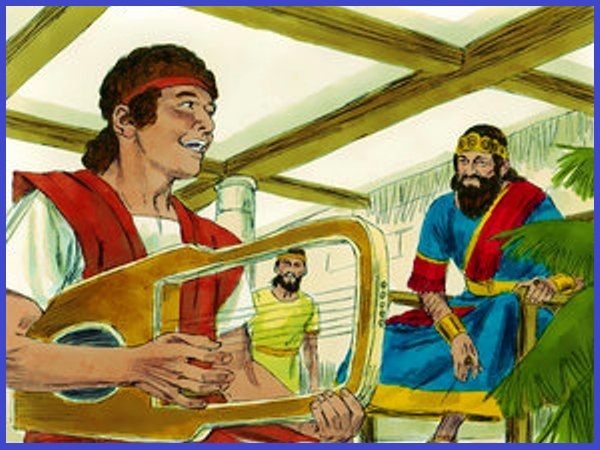 David had also been serving Saul because he had a very bad problem because he disobeyed God and he always was very nervous so David played the harp and that helped him to relax. But David went back and forth from helping King Saul to tending his father’s sheep. Goliath came out every morning and evening and he stood before the Israelite army and dared them to send someone to fight with him. Can you imagine, this continued for 40 days? 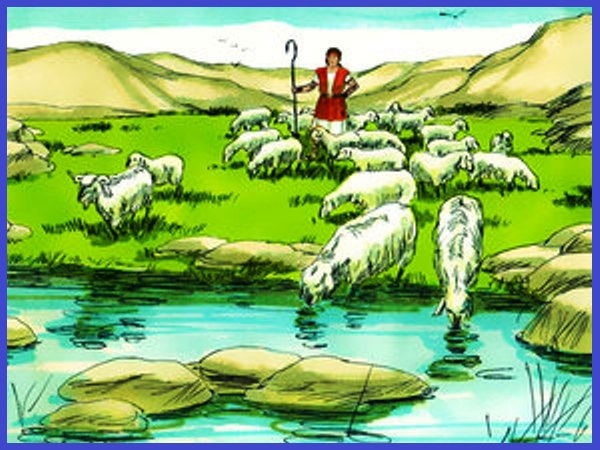 Early the morning David left the sheep that he was caring for with another shepherd. He took the food and left as his father had told him. When David arrived at the camp, the army was leaving. They were going out to their usual battle positions. The soldiers were shouting their war cry, you know just like the Indians would do. 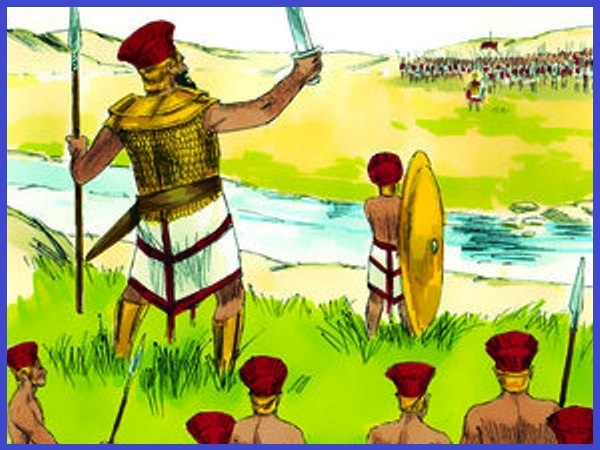 The Israelites and Philistines were lining up their men to face each other in battle. When David got there he left the food with the man who kept the supplies and then he ran to the battle line to talk to his brothers. While he was talking with them, Goliath came out and that was the first time David got to see him. This time when he shouted things against Israel as he always did David heard it. 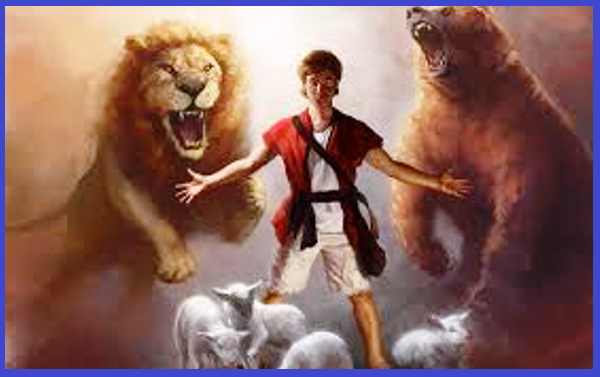 He also noticed that when the Israelites saw Goliath, they were very much afraid and ran away. 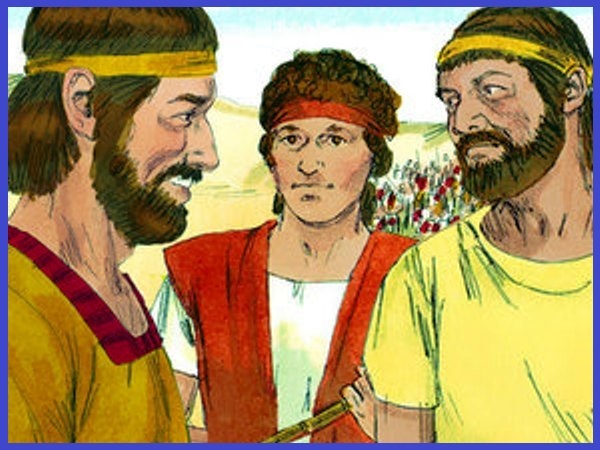 David was very surprised at this brother’s attitude and asked, “Now what have I done wrong? Can’t I even talk?” Then he turned to other people and asked the same questions. And they gave him the same answer as before. Some men heard what David said about Goliath – that he was being disrespectful against the living God – and told King Saul. 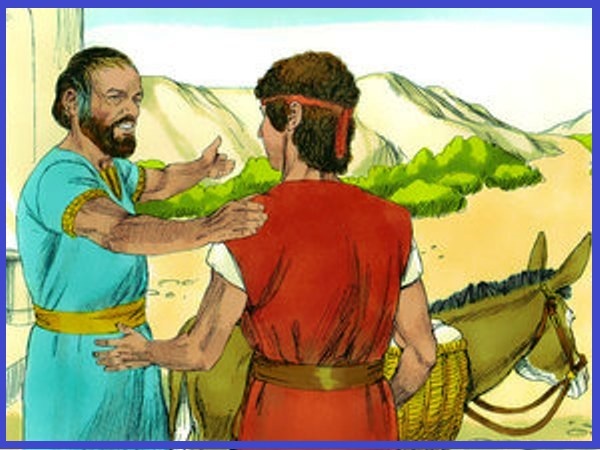 Then Saul ordered David to come to him. 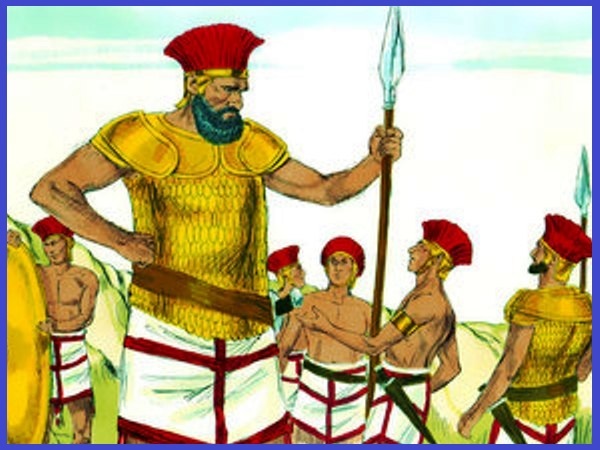 Then King Saul put his own battle uniform on David, he put a bronze helmet on David’s head and armor on his body. 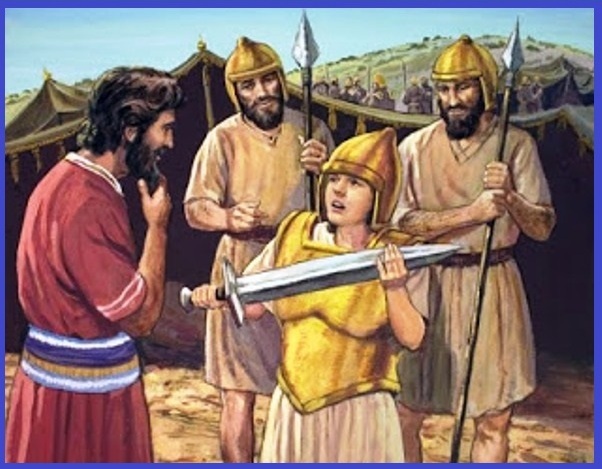 He gave him his sword and David tried to walk around in all of this armor, but he was not used to the armor Saul had put on him. He said to Saul, “I can’t go with all this on me; I’m not used to it.” Then David took it all off. 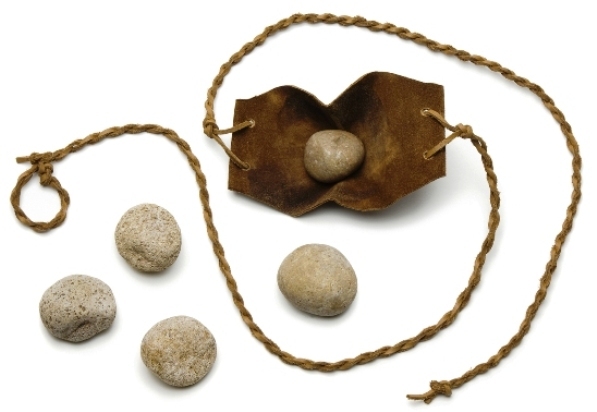 He took his shepherd’s stick in his hand and chose five smooth stones from a stream. He put them in his pouch and held his sling in his hand. Then he went to meet Goliath. As David was doing this, Goliath was coming closer to him and the man who held his shield walked in front of him. 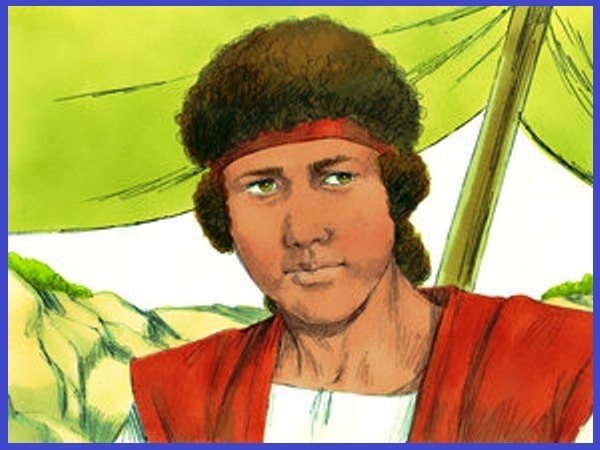 Well, Goliath took a good look at David and saw that he was only a handsome boy that was tanned from being out in the sun tending his father’s sheep. 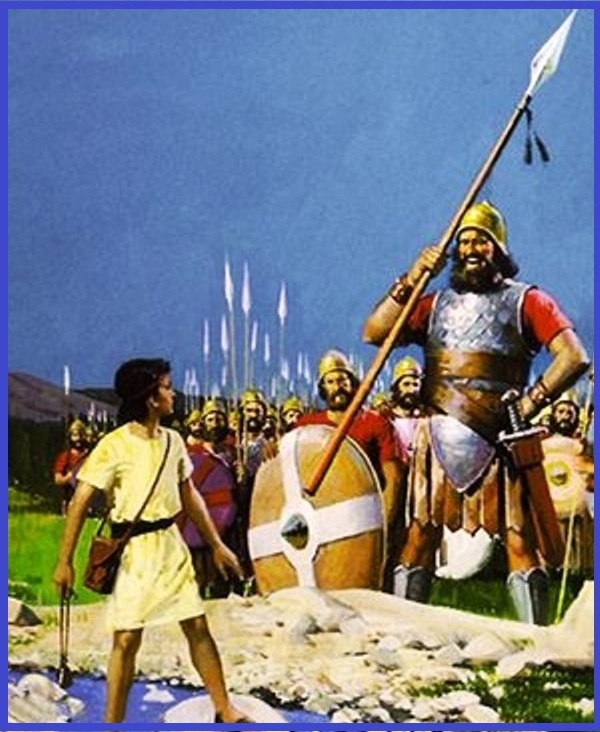 As Goliath came near to attack him, David ran quickly to meet him. He took a stone from his pouch. He put it into his sling and slung it. 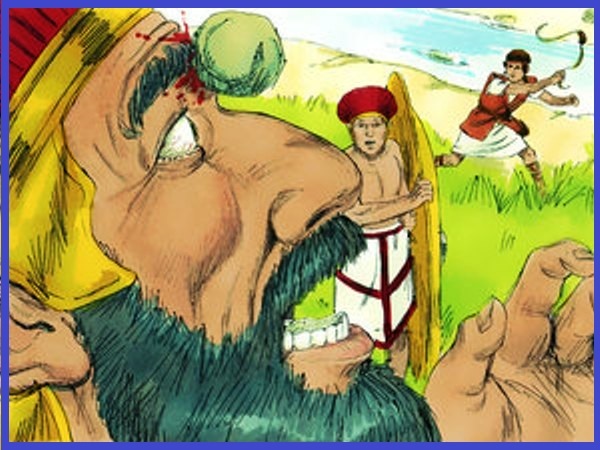 The stone hit the Goliath on his forehead and sank into it and Goliath fell facedown on the ground. 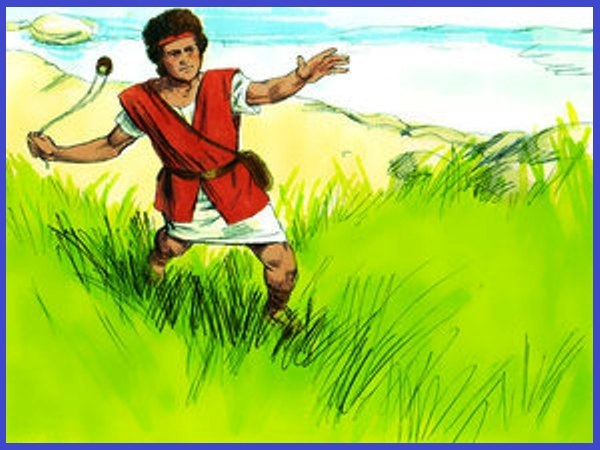 So David defeated the Philistine with only a sling and a stone! He hit him and killed him. He did not even have a sword in his hand. 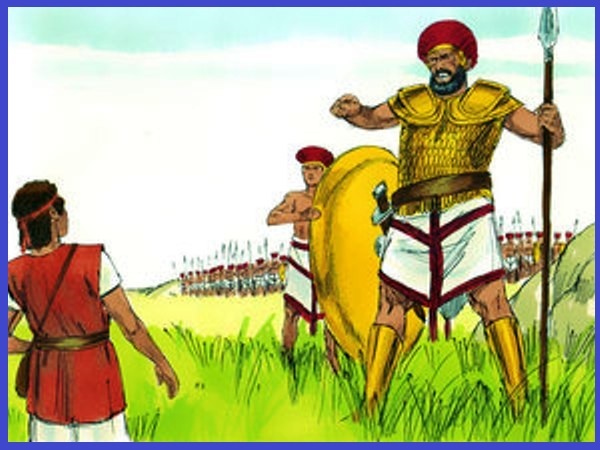 David ran and stood beside the Philistine. He took Goliath’s sword out of its holder and made sure he was dead. 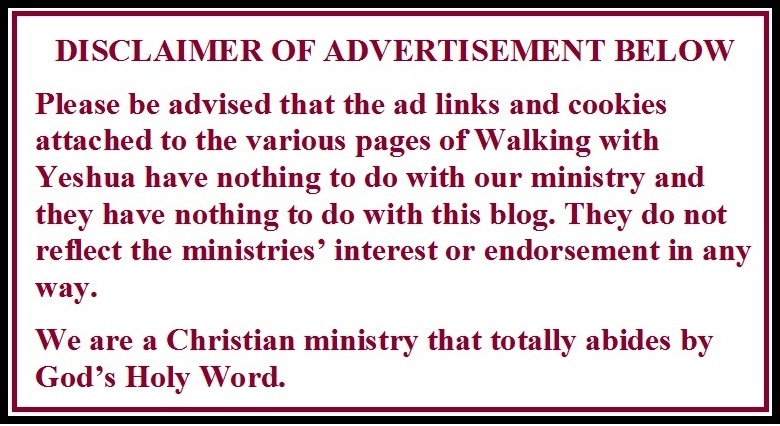 When the Philistines saw that their champion was dead, they turned and ran. 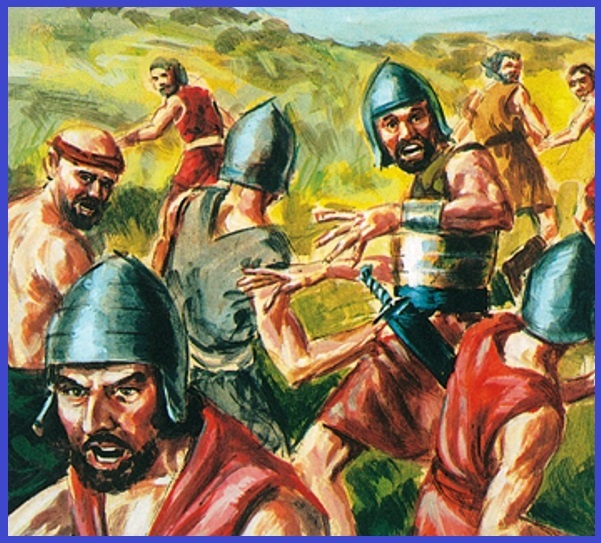 The men of Israel and Judah shouted and started chasing the Philistines. They chased them all the way to the entrance to the city of Gath and continued until the gates of Ekron. Many of the Philistines died. And when the Israelites returned after chasing the Philistines they took many things from the Philistine camp. 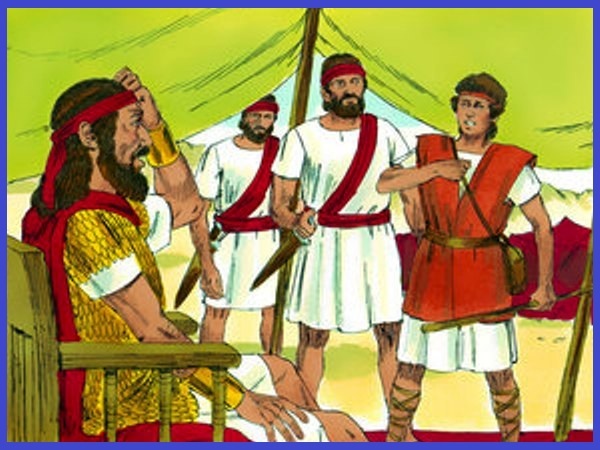 David took Goliath’s weapons and placed them in his own tent. 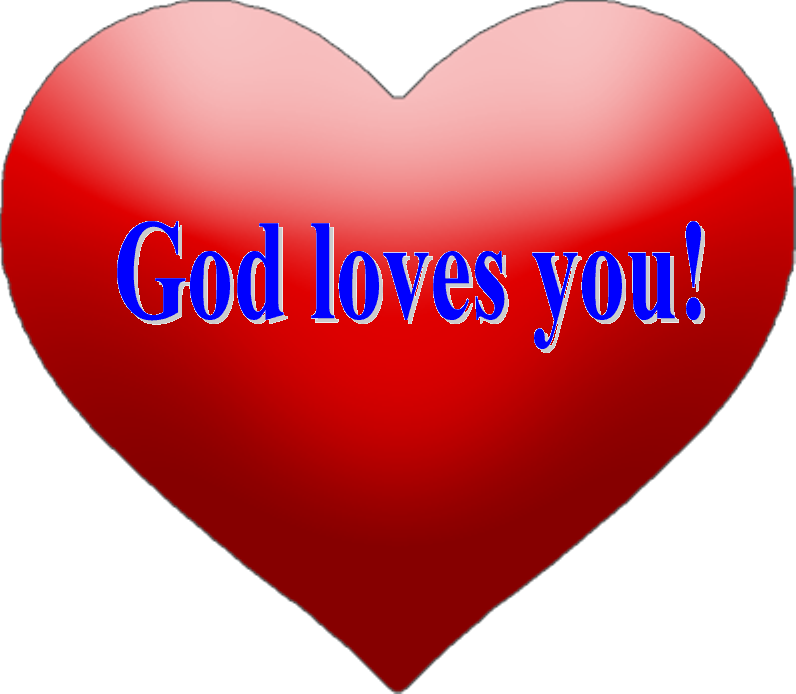 Now all the Israelites were happy because they had won the war and Goliath was not a threat to them any more.